Did you know that there is a 5 start resort tucked away in the hustle and bustle of your city? 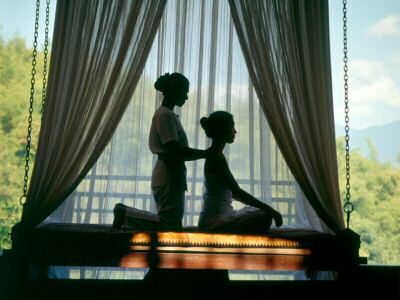 We already mentioned the The Banjaran Hotsprings Retreat in Ipoh. Today we will have a closer look at the Cyberview Resort and Spa in Cyberjaya - the inspiring silicon valley of Malaysia - about an hour's drive away from Kuala Lumpur. The Cyberview Resort and Spa is your perfect getaway when you want to spend your weekend away from the buzzing noises of the busy city without having to drive for hours and hours in a row. 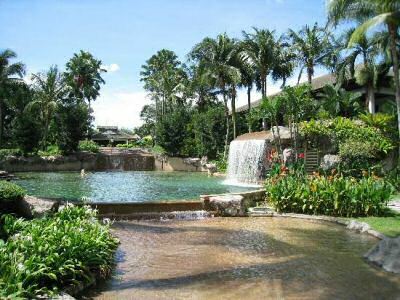 The resort is surrounded by lush greenery and water features and hosts chalets, suites and boutique-styled bungalows. Foodwise you can enjoy a bistro and a restaurant and relaxation wise, do pay a visit to the spa. The Verandah Pan-Asian themed restaurant serves dinner in buffet style, and when I was there, they offered a variety of Japanese, Italian and Malaysian dishes, all while meditating on the idiom: “the slow and steady wins the race”. Breakfast was a bit disappointing to find the typical western-style, however, 'nasi lemak' (the famous Malaysian coconut rice dish for breakfast)is also on the menu! Of course, no need to drive 1 hour to eat: what about the beach? Arriving at the resort. don't settle for your wonderful room with an inviting four-post-bed, but change into your bathing suit and stroll around to discover the facilities and the pool: a free-form structure complete with jacuzzi and waterfall. The brown pebble stones gives you an illusion of sand and coupled with the reflection of the palm trees lining the pool, you can imagine yourself lying on a far away beach. For a perfect pampering book the Sembunyi Spa for both a hands and feet manicure and pedicure session, as well as the "Serenity" traditional Balinese massage. The Spa offer a 10 thousand square feet area of peace for your body, mind and soul with the hot jacuzzi, sauna and lappool as well as many other massages and body and facial treatments as the two I mentioned. You will enjoy the Cyberjaya 5 star resort and spa most when you arrive Friday after work and return back home on Sunday: the perfect beach, spa and resort getaway only 1 hour away from your weekly Kuala Lumpur office life.